The “falling three” is a bearish chart pattern that often ends in a correction to the downside. The pattern usually forms when the market makes a brief bullish move in a bearish trend. This five candlestick arrangement is closely connected with the falling wedge and triangle patterns. All of these patterns can appear when a downtrend is experiencing a consolidation or a brief correction phase. It’s important to analyse the falling three carefully before trading because many “weak patterns” don’t play out in the expected way. Whipsaw markets can often trigger stop losses before a profit is made. We also find that at the lower time frames, the falling three can have a contrarian bias. 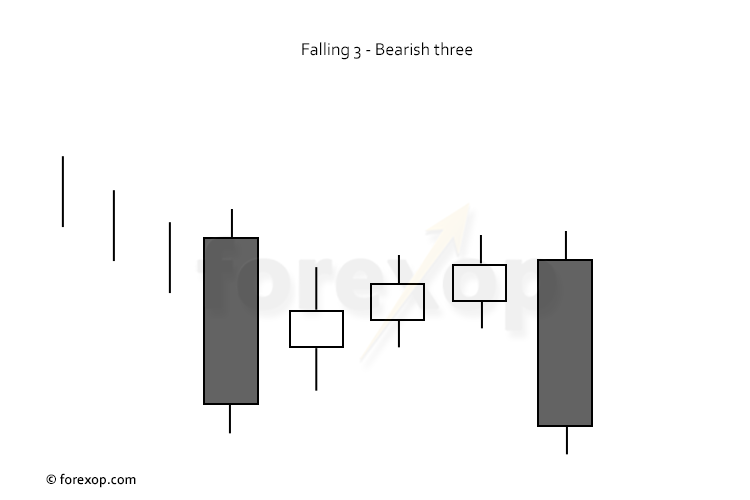 A basic falling-3 pattern is made up of two long black (bearish) candlesticks that sit either side of three smaller white candlesticks. The three middle candlesticks represent a failed bullish rally. Keep in mind that the falling-three method is not expected to predict long term trend but rather just a few bars ahead. 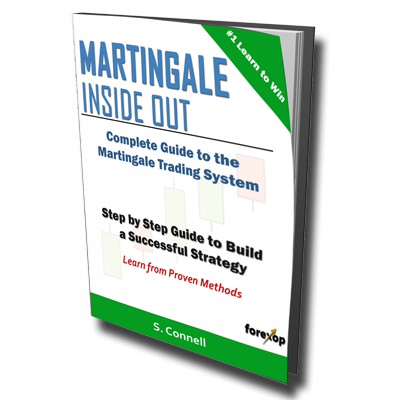 The success rate of the pattern is chart dependent and market dependent. On EUR/USD, USD/CAD and GBP/USD four hour charts we’ve seen a reliability rate of about 55-60% on each appearance. That means in up to 60% of occurrences, the market did make a bearish correction just after the pattern completed. With other charts, the market swings are far more marginal and harder to predict. On the lower period charts we’ve found that the falling 3 often has a contrarian bias. So the market in fact has a preference for an upwards correction rather than a downward correction. This is why reading the chart and looking for other confirming points is particularly important when trading the falling three. The chart below illustrates a typical falling three arrangement. Highlighted in the red box we see the five bars that make the pattern. The two outer bars are bearish but the three inner bars together are rising (bullish). 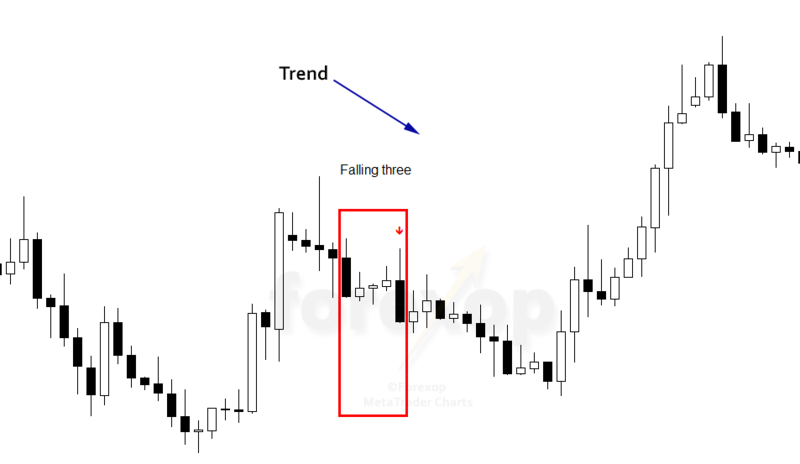 The pattern appears in a steady downwards trend so that the inner candlesticks form a brief upward correction. At the end of the pattern the market closes below the level of the first candle. This means that the upwards move was reversed as sellers manged to push the market lower. Notice in Figure 2 how the first four bars of the falling-three form into a triangle. The final bar represents a bearish breakout of the triangle. This is a useful way to analyse the pattern from a different standpoint. For example the chart in Figure 3 shows a falling three at two different scales. The pattern forms on the four hour chart. If we zoom lower into the hourly chart we can see a characteristic wedge/triangle pattern forming. 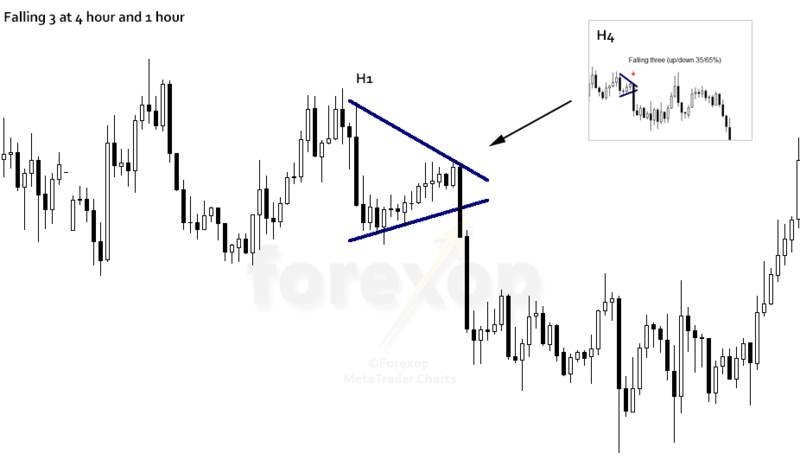 The triangle completes with a strong bearish breakout. 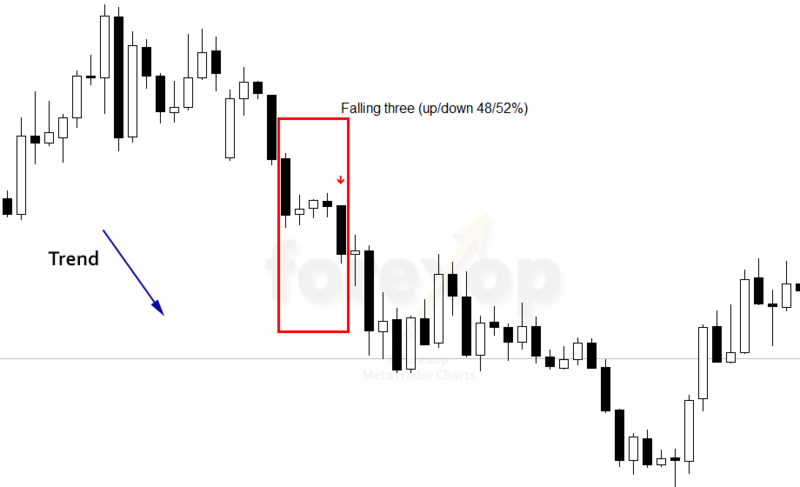 When trading the falling-3 pattern, it’s always sensible to investigate the price action at the lower time periods in this way. This will give us a strong clue as to which way the market will eventually break. We look for gradually shrinking bars at the lower time frames as this indicates contracting volatility. The breakouts in these patterns are frequently very powerful and tend to follow on from a rising market on reduced volatility (see Figure 3). The chart in Figure 4 illustrates another “high probability” setup. A strong downtrend is interrupted by a brief, bullish rally. This is marked by the three inner bars. The falling three pattern only triggers when the three inner bars don’t break above the first one. That means we know by the definition of the pattern that the correction doesn’t have a great deal of momentum. That of course is only the picture at that instant in time. We have to make a judgement as to whether that will continue. In this instance the final bar in the pattern closes well below close price of the first bar. That means we can be reasonably sure that the downwards trend is resuming and that the upwards rally has failed to draw in momentum buyers.